The steps below will guide you on how to configure Wireless MAC Filter with your Linksys router to permit or prevent the wireless devices connected to your Linksys Range Extender. This can be a useful workaround if you have trouble connecting your wireless devices to the Linksys Range Extender with the MAC Filter enabled on your Linksys router. IMPORTANT: Before you proceed with the steps below, you need to have the firmware version of at least 1.1.01.003 on your Linksys Range Extender. To know how to download and upgrade the firmware, click here. 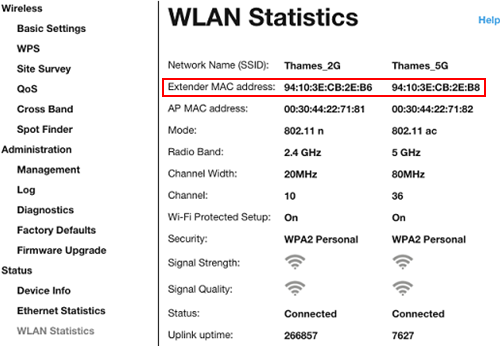 On your Linksys Range Extender’s web-based setup page, click Status > WLAN Statistics and look for the Extender MAC address section. This is the address that must be added to the Linksys router for the Range Extender to connect to the network. For the detailed instructions, click here. Once you have obtained the Extender MAC address, you can now set up the Wireless MAC Filter on your Linksys router. Access your Linksys router’s web-based setup page. For instructions, click here. If you are using a Mac® computer, click here. NOTE: The IP address of the router is 192.168.1.1 by default. If you have changed it, enter the new IP address instead. 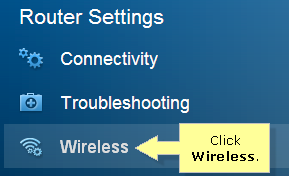 On the left navigation pane, click Wireless under Router Settings. Check the Enabled box. When the Enabling MAC filtering will disable WPS. Do you want to continue? prompt appears, click Yes to proceed. Select among the two (2) Filter options. NOTE: In this example, the Deny access for the listed MAC addresses option is selected. Deny access for the listed MAC addresses – Select this option if you want to create a list of MAC addresses that cannot access your network. Any device whose MAC address is listed will not be permitted to connect to your network. Allow access for ONLY the listed MAC addresses – Select this option if you want to limit access to your wireless network for certain devices. Only the devices whose MAC addresses are listed will be allowed to connect to your network. All other devices will be denied. NOTE: The Linksys Range Extender is L2NAT Bridge. The MAC address of all the devices behind the range extender will share the same Extender MAC address. It is implied that if you add the Extender MAC address to the Allow access list, not only the range extender can access the router, but also all the devices behind the range extender will have access rights. Click Add MAC Address on the MAC Filter List section. Enter the Extender MAC address, then click Save. You have now successfully configured the Wireless MAC Filter on your Linksys router with your Linksys Range Extender.